Looking for lunch box inspiration? Check out our 1 week of easy and healthy lunch box ideas. If you loved our Coconut and Apricot Balls, you will love our 3 Ingredient Apricot Balls. This version is slightly healthier, containing no sweetened condensed milk but instead containing honey to bind the mixture. This is the perfect recipe to make bulk batch of ready for school lunches, just double or even triple the ingredients. They also freeze perfectly, and can be eaten straight out of the freezer (which makes it all too easy to grab one on the way past the kitchen. This recipe makes approximately 12 apricot balls, but I usually make a double batch and freeze half. Place the dried apricots, honey and 1/4 cup of coconut into a food processor. Process until mixture is well combines and begins to form a ball. Using wet hands, roll tablespoons full of the mixture into balls. Roll in the remaining 1/4 cup of coconut, and place on a plate or baking tray. Refrigerate for at least 15 minutes before serving, or alternatively store in the freezer. 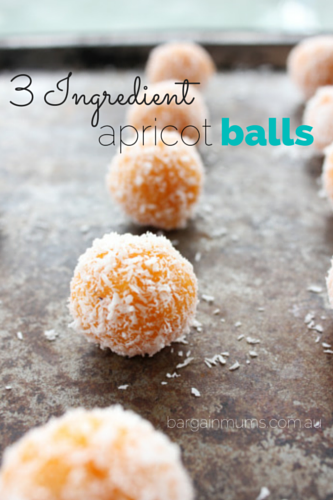 HAVE YOU TRIED OUR 3 INGREDIENT APRICOT BALLS? LET US KNOW YOUR THOUGHTS IN THE COMMENTS BELOW.